Looking for more power to amp up your performance on the race track? Well, batteries are the component that provides RC cars with their power. Having the best lipo battery will ultimately result in better performance. A popular type of battery is the Lithium Polymer (LiPo) battery. Read ahead to find more about these amazing powerhouses. The Gens Ace 2s LiPo is the best lipo battery on the market right now in my opinion. This workhorse battery provides ample power to all types of RC vehicles. Its smaller and lighter and will fit most rc car brands. It’s quickly charged with fast charge capabilities and has a long lifespan. LiPo batteries are made from lithium Polymer, thus shortened to LiPo. They are a type of rechargeable battery used in many RC vehicles such as cars, trucks, planes, helicopters, and quads. These batteries are lighter in weight and have larger capacities, This ensures the battery can hold more charge in itself. They can be modified into a variety of shapes and sizes. Apart from all this, they have higher discharge rates as well. However, these batteries have a shorter lifespan than other NiMH batteries and can catch fire easily. Voltage (V): This term represents the voltage of the battery. A typical LiPo cell has a nominal value of 3.7 V. If there are two cells, the voltage will be 7.4 V while for 3 cells, it will be 11.1 V.
Number of Cells (S): The number written with S represents the number of cells in the battery case. The more the cells, the higher the capacity will be. Capacity (mAh): It represents the maximum power you can draw out of the battery. The larger this number is, the longer it will provide power. It is represented in Milliampere hours (mAh). Discharge rate (C): The discharge rate represents the amount of charge it can discharge without any damage to the battery. It is represented by Columbus. 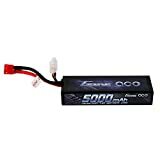 When it comes to choosing the best liPo battery pack for your RC, there are a number of attributes that need to be considered before you can decide on a specific brand. An average user might not be able to understand these attributes properly. So, we have researched thoroughly to provide you with a buying guide of sorts to help you make an informed decision. Just like when buying anything else, the budget needs to be considered first. Batteries can be an expensive commodity. Some brands are more expensive than others. However, expensiveness does not necessarily indicates quality. So, take the brand name into consideration as well. Set out a budget for the battery pack and find a suitable one for your car within the budget. Another important consideration is how long the battery will last before it dies. Even with rechargeable batteries, they can only be recharged so many times. After that, they slowly start losing their charging capabilities and die out. So, look into the number of times the battery can be recharged before buying it. Voltage needs to be a nominal value as mentioned above: 3.7 for a single cell, 7.4 for a 2S and 11.1 for 3 S.
The higher the voltage, the quicker the charge will transfer and thus the faster the speed will be. So, if you are looking for some high-speed applications, go for a 3S with 11.1 V.
Capacity determines the potential of a battery. The higher the capacity, the more charge your battery can store and thus it would run for a longer time. However, most large capacity batteries are larger and heavier and thus might not fit in your vehicle. Choose one with the highest capacity and smallest size. The C rating refers to the discharge rate of the battery. The higher the C-rating the faster the battery will discharge. This would result in an immense increase in the acceleration of your RC cars. However, the RPM needs to be taken into account as well. Most LiPo cells are delicate and thus can be easily damaged. They are packed in a Hard plastic case that protects the internal cells. Other battery packs use a thinner, flexible pack. We recommend going with the strongest, rigid pack as it would provide the most protection. Some packs might have sharp corners while others might have rounded ones. There are various types of connectors out on the market. Tamiya style plugs cannot handle high current level applications. The Deans style plug, however, is the best in the market and are compatible with most Rc cars. The Losi and Traxxas connectors are great as well. You can choose any one these. Ensure that the wires are connected to Zero Loss plugs that ensure no loss occurs. As LiPo batteries are not rebuildable so they need to be replaced quite often. When your battery has come to the very end of its long lifetime, it is the time to dispose of it. However, disposing of a battery safely can be an issue as well. Here are 4 steps to dispose of your battery. Discharge: You can safely discharge the battery as much as possible. Connect it to a bulb, use up all the power. Put it in a salt water solution: Saltwater is extremely useful as it can further discharge the battery. Simply mix some salt and water and submerge the battery fully into the solution. Keep dissolving more salt until no more salt can dissolve. Keep the battery in there for a day. Check Voltage: If the voltage has dropped to zero, it is now safe to dispose of the battery. However, if it has not, then repeat the salt water solution step until it becomes 0. Throw it: Once 0 Voltage has been achieved and the battery is fully discharged, it will not harm the environment and thus, you can simply throw it in the trash. Now that we know a little more about the features that make the best lipo batteries, let’s take a quick look at a couple of the standouts! 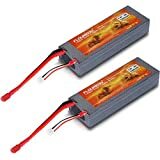 These LiPO batteries have an outstanding lifespan and will provide plenty of power for all your RC vehicles. The Gens Ace LiPo Battery Pack Hardcase is manufactured by one of the top ranking battery manufacturer in the world. This exquisite battery is perfect for RC Cars, planes and boats. The capacity of this battery is 5000 mAh and it operates at a voltage of 7.4. The battery is quick to recharge as it has a discharge rate of 50C. The Gens Ace is manufactured using Japanese and Korean lithium Polymer as the raw materials. The battery utilizes automatic stacking technology for a much better performance. The Energy Density of the battery is about 200 Wh/kg. The Gens ace has a long life and can be charged approximately 150 times, perhaps even more. It is equipped with a Dean’s plug which makes for the ideal choice for your RC car. 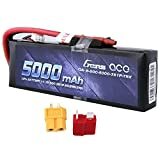 This battery is compatible with 1/8 or 1/10 RC car models such as Losi, Traxxas Slash, Axial, Jammin, Exceed, and many other popular brands as well as RC trucks, cars, helicopters, boats etcetera. It is perfect for all types of RC enthusiasts. Long lifetimes of at least 150 times. Provides at least a run time of 30 minutes. Compatible with a lot of popular models. It can have uneven charge distribution. 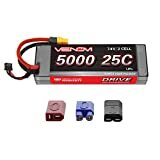 If you are considering a heavy duty battery with higher run times and lower charging times, then perhaps the Venom would be perfect for you. 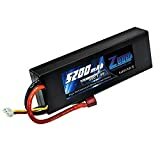 This LiPo battery has a capacity of over 5000 mAh and works at a voltage fo 7.4 V. The hard case battery provides the ultimate power to your RC car to help it achieve top performance. The best part of this battery case is that it is equipped with a High Current Universal Plug System which makes it compatible with a Traxxas Plug, Deans Plug, Tamiya Plug and EC3 Plug. The maximum continuous discharge rate is 25 C which results is better run times. The maximum voltage per cell is 4.2 V while the wire gauge is a 12 AWG flexible and soft low resistance wire. This brand of battery is perfect for RC professionals as it supports all the professional brands such as Traxxas, Tamiya, Exceed, Duratrax, ARRMA, HPI, Losi, Kyosho, and Associated. Uses a Universal plug compatible with other different plugs. Better run times up to 15 minutes. It can end up with swelling if charged too much. The Fluoreon LiPo Battery Hard Case is one of the most reliable battery cases in the market for RC cars. The Fluoreon is equipped with a capacity of about 5200 mAh which means that it provides longer run times enabling you to play with your car as long as your heart desires. The 7.4 V battery case comes with a Deans T Plug connector which is compatible with most RC car models. The Discharge rate of the battery pack is 30 C which ensures smaller charging times. The battery pack consists of 2 batteries each with a voltage of 4.2 V. They are available in hard cases which provide protection to the battery and ensure your overall safety. The battery case is compatible with a huge number of RC cars and even many airplanes, helicopters, boats and quads. These batteries are perfect for professional racers who require a longer runtime as it can run for more than 30 minutes if used on a compatible car. High Capacity of 5200 mAh. Can be used with many popular Rc cars. Longer run times of more than 30 minutes. Lower charging time less than 30 minutes. The two batteries might be inconsistent with each other. Another battery from Gens Ace, the 3 Cell battery is as reliable as their other products as Gens Ace is a trusted and professional brand. The Battery Pack consists of 3 batteries which work at 11.1 V and have a capacity of around 5200 mAh. They are constructed from Japanese and Korean Lithium Polymer which are of the highest quality. The Connector is a Deans Plug which is compatible with most Rc cars and an XT60. The 50 C discharge rate provides a burst of acceleration and power to your RC cars. The battery has a long lifetime and can be charged a minimum of 150 times. The battery is specifically designed for Traxxas Slash, E-Maxx Brushless, E-Revo Brushless and many other brushless models which make it perfect for professionals looking for that extra punch on the racing track! It is equipped with a balanced lead protector to prevent the plug from falling off. Compatible with a lot of brushless models. Lead Protector prevents the plug from falling off. Longer lifetime up to 150 times. Better run times of 40 minutes. It does not come with a hard protective case. Not much suitable for brushed models. The Zeee LiPo Battery Hard Case is a two battery pack that is perfect for your next rc car on the track. The battery pack has a voltage of 7.4 V and a capacity of about 5200 mAh. The charging rate is about 50 C.
The large charging rate, as well as the huge capacity of the battery, ensures that the LiPo battery has a longer run time and all the power you need to cross your opponents on the track. The Plug featured in the Zeee is a Dean Style T Connector which is excellent for use with many popular RC car models. The battery features a longer lifetime as well. The battery is compatible with all 1/10 scale vehicles such as Traxxas Slash, Rustler, Bandit, Stampede, E-Maxx, E-Revo, and Monster jam etcetera. The Zeee comes with 6 months of warranty as well. A long lifetime of the battery. Compatible with most Rc cars models. It has uneven charge distribution between the two cells. All in all, any one of these batteries will amp up your performance in the best way possible. However, if we had to choose favorites, we would definitely choose the Gens Ace 2S battery pack as the best lipo battery today. These battery packs are smaller and lighter than the 3S and thus, will fit most RC Cars. It features a long lifetime and can run up to 150 times. It features a Dean’s Plug and is thus compatible with most popular RC cars. They provide a better acceleration as they have a C-rating of 50 and can be charged quickly. The 5000 mAh, 7.4 V battery with a hard case is perhaps your best bet against your competitors on the race track!